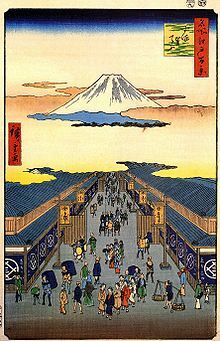 Enpō (延宝), also Empo, was a Japanese era name (年号,, nengō,, lit. "year name") after Kanbun and before Tenna. This period started in September 1673 and ended in September 1681. During this time, the reigning emperor was Reigen-tennō (霊元天皇). 1673 (Enpō 1): A great fire destroyed much of Heian-kyō. 1673 (Enpō 1): Mitsui opened a dry goods store in Edo. 10 May 1674 (Enpō 2, 5th day of the 4th month): Ingen died at Mampuku-ji near Heian-kyō. 1675 (Enpō 3): A great fire in Heian-kyō. 1675 (Enpō 3): The Bonin Islands are explored by shogunate. 7 April 1680 (Enpō 8, 8th day of the 3rd month) : Tokugawa Ietsuna died. ↑ Nussbaum, Louis-Frédéric. (2005). "Empo" in Japan encyclopedia, p. 176. ↑ 3.0 3.1 3.2 3.3 Titsingh, p. 414. ↑ Hall, John Whitney. (1970). Japan: From Prehistory to Modern Times, p. 209. ↑ Tanaka, Hiroyuki. (1993). "The Ogasawara Islands in Tokugawa Japan", Kaiji Shi Kenkyuu (Journal of the Maritime History). ↑ Titsingh, p. 414; Meyer, Eva-Maria. (1999). Japans Kaiserhof in der Edo-Zeit, p. 186; Imperial Household Agency (Kunaichō), 後水尾天皇 (108); retrieved 2012-5-27. This page was last changed on 10 December 2018, at 16:22.